The edible Map project has been an ongoing since 2010. The project aims to collect spatial data on urban land that could be made available to grow food. The project has been used in Peterborough, Newcastle, Hackney, and Dallas as well as Croydon and Elephant and Castle. In developing the project I am seeking to find a bridge between academic research, economic developments, and people within the subject of urban food production. 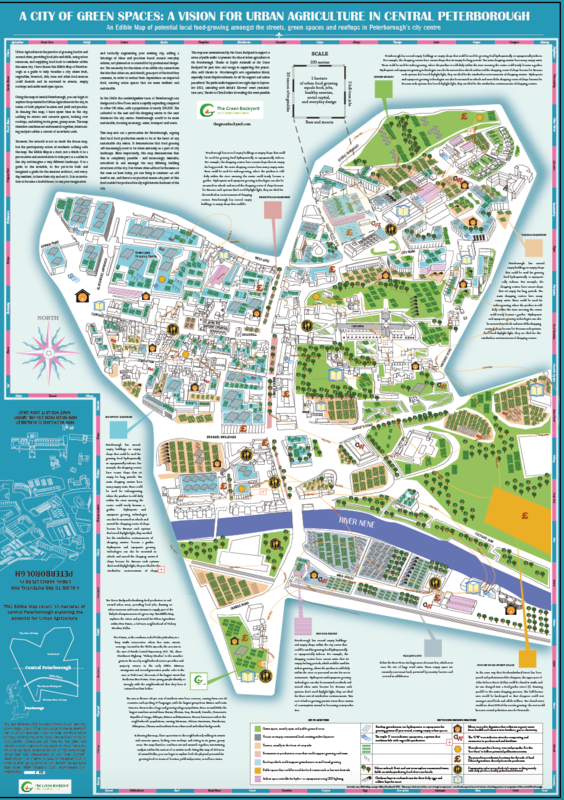 The basic concept of the Edible Map is best understood as a data-driven site-specific visualisation tool to engage with people in their own neighbours through a walking and talking. This walking and talking takes the form of a specify event, usually over a week, composed of 16 twice daily walk of around two hours. Each walk is different because the people who walk with me and talk to each other are different. The map itself is drawn from accurately measuring available urban spaces and then suggesting a food growing practice that could happen there. Therefore, I am taking spatial data (measurements of disused car parks, rooftops, grassed spaces for example) and then adding a value; while some might think of adding a skate park, mini-golf, or a pop-up bar to these spaces, I am adding food production. My values are those of sustainability, food security, and urban resilience from local food production, as well as an interest in how the actions of residents might form part of an ‘everyday urbanism’. . While the importance of local food-growing is fast gaining ground, the ability to conceive of urban food production actually happening within the bewildering array of structures and surfaces of the city is a difficult concept. Walking the local neighbourhood with an Edible Map as a guide, residents could start to picture a very different landscape of vegetable plots, orchards or beehives. Katharine Harmon writes, ‘Geographers submit to a tactic agreement to obey certain mapping conventions … artists are free to disobey’ (1). The Edible Map presents an obvious distortion and interpretation of the space mapped, relative to specific situations of a spatial practice (food growing), where the streets, roads and pavements are effaced as if it had snowed. This opens up new spaces in our imagination, normally contained by those who pre-plan our routes between buildings or expected uses of space. But the Edible Map is more than a visualisation tool. It also attempts to investigate examples of agricultural yields that the immediate area, allowing the itinerant urban resident or visitor to visualise what percentage of their current diet could be supported using locally grown food. 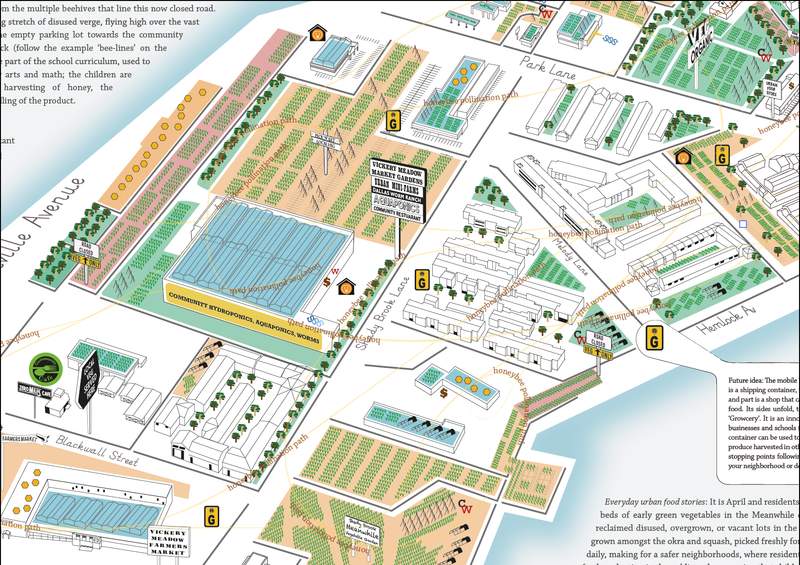 Drawing-over the usual cadastral A-Z map, the Edible Map intervenes with robust data on space and crops, combined with an everyday narrative of urban farming. This translates ideas of “local food” into tangible, interactive and playful stories, reconnecting people to a sense of place through local food-growing.